I wanted to get a date on the 2 outer bulbs But I also threw in a new phillips 175watt to show the arc tube after only 1 week of use, The westinghouse clear lifeguard on the right has also been used for a full week, Notice how the center bulb has alot of whitening in the center of the arc tube already, The westinghose does not. And the electrodes on the phillips are half the size.. Anyway The lifeguard is date code d4, And the 100watt sylvania is marked as sr 112. Oh yeah Snoopy likes the lifeguard he was helping me keeping them from rolling! I believe it may be in fact a 84 bulb cause the story was it came with the fixture I bought for my back yard, The seller of the fixture said the bulb was purchased when he bought the fixture back in 84 and the fixture itself is dated from 84. The Westinghouse logo is also on the bulb. I do strongly think it's not a true westinghouse but a phillips westinghouse. And I also thought they did not make ED shaped back then but I wanted to confirm what I was told by the seller that it was in fact a 84 and the date code states it. So if the Westinghouse logo was replaced in 86-87 how rare do you think this bulb may be? It's an odd lamp for sure! All the 1980's Philips Westy lamps I have seen have been BT shaped. I also have some 1986 Philips Lifeguard lamps in the BT shape. At first I thought "no way can it be an '84" but I took a close look and it has the inner construction like my Norelco mercs except the arc tube. Maybe it was made at the Norelco HID plant? I have seen Norelco-made fluorescents with the Westinghouse name from '84 or so. I think it's a disgrace allowing the Westy brand and arc tubes to be inserted into ED shaped lamps of mostly Philips construction. Still, a rare and weird lamp, maybe worth collecting! Somthing in my head told me not to burn this lamp anymore and to go buy whatever at the store so I did. I know lifeguards are common as dirt on ebay and elsewhere still, But I have yet to come across a westy logo ed style lamp. 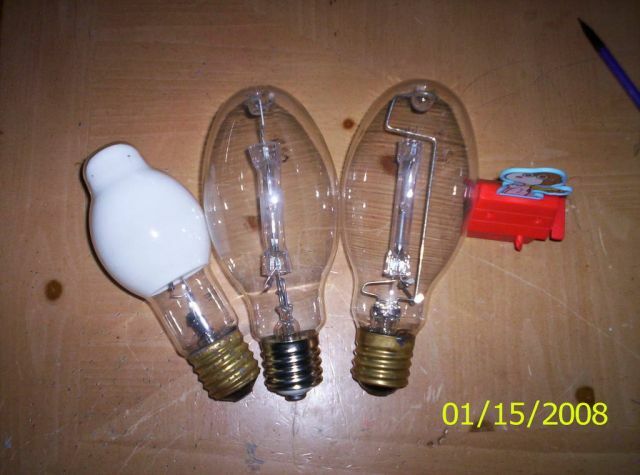 Even know I don't have to much knowledge on older mercury vapor bulbs. I will take another pic of this bulb without flash on the etch as soon as I get a chance. Maybe the stamed info on the base may give alittle more info on it's plant's maker, the base has the following D4 D4 JFMAMJJASOND-1234567890..R.. Also the arc tube has a few scratch lines from one end of the arc tube to the other one very noticeable. I am sure you already know this, but I'll say it anyway the JFMAMJJASOND are all the first letters of the month the J for January and D for December....the 1234567890 are for last digit of the year......the R helps a bit, it is 1980 or after....because all lamps from 1980 and after has an "R"
Now Look at the stem press there may be a date code on it too! What does the etch say??? I like the coated one..Looks cute! I looked everywhere on this bulb and nowhere is the name phillips listed, No codes or nothing on stem, Very odd. Yeah jason lol, I kinda figured the letters on the base were months but I did not know what the numbers were for or the R. Also I'm not sure if other older bulbs are like this but the starting resistor is very different looking than others I seen, Kinda looks like a pencil graphite core. I have taken a picture of the etch and posted it and I am sorry for the focus quality. Oh yeah, The sylvania kinda reminds me of a baby bottle.